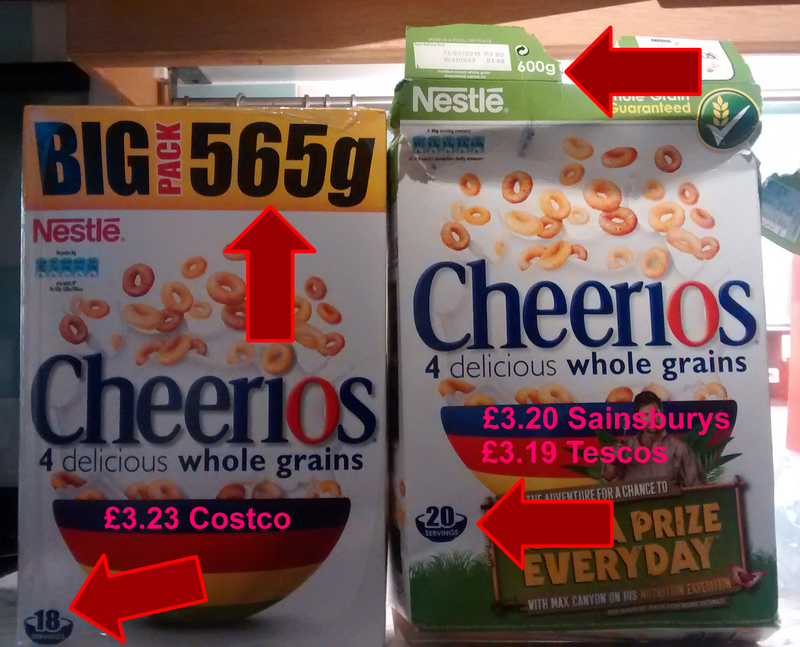 Yesterday we went to discount warehouse Costco and came home armed with a shed-load of goodies, smugly satisfied at having grabbed some real bargains, especially the box of Nestle Cheerios with its slogan BIG 565g PACK (which came in a pack of 3) at £9.69 i.e. £3.23 per box. Not so, it seems. Our current pack of Cheerios (purchased from Tesco, usual price £3.19) contains 600g i.e. MORE than the so-called BIG 565g PACK from Costco – and without the huge slogan proclaiming the ‘bargain’. Yet the boxes themselves were the same size. As a copywriter and marketer, this kind of misleading blurb – which makes me, with my consumer hat on, think I’ve grabbed a bargain when, in fact, I’ve been sold ’18 servings’ of Cheerios instead of ’20 servings’ for the same price (give or take a few pence) – leaves a bad taste in my mouth. Especially when purchased at a retail outlet where I assume I am getting a good deal. And it’s not just Nestle at Costco, the ‘drained weight’ of tinned tuna, for example, varies massively depending on the brand and retail outlet, often with the same brand varying according to outlet. And, in my experience, it’s the so-called ‘discount / value / bargain’ stores that sell the reduced-weight products. Sending emails or direct mail? Important new laws come into force on 25th May 2018. Yeah, but WHAT does the product DO? WHAT does the text MEAN? So much to do, so little time to do it! Get those apostrophes under control! Copywriting portfolio: just where do I start with this little lot?